Product prices and availability are accurate as of 2019-04-22 17:34:06 UTC and are subject to change. Any price and availability information displayed on http://www.amazon.com/ at the time of purchase will apply to the purchase of this product. In the tradition of S.M. Stirling's General series and Jerry Pournelle's CoDominium novels comes New Persia: Before the Storm by John L. Lynch. Combining Cold War military equipment and tactics with a believable future setting, New Persia: Before the Storm is a retro military science fiction space opera. In the far future, on a distant world, civilization is rebuilding itself after centuries of barbarism. The wasteland, where no Earth life can survive, spawns great firestorms which devastate everything in their path. Hurricanes of fire rain destruction across thousands of miles.Civilization rises and falls according to the whim of the storms. Civilization is now divided between two competing powers. The Azanians, stung by defeat in the last war, are ready for a rematch. They plan to attack when the next firestorm hits New Persia. They have amassed a formidable arsenal of tanks and jet fighters. To oppose them, New Persia has Captain Basir Turani, a young tank commander, and Farad Hashemi, an ace fighter pilot. With tanks and planes reminiscent of the 1950s on Earth, they will fight the invasion of their homeland. Two women, Suri Pahlavi, and Nasrin Avesta will rise to the occasion beyond the role society expects of them. On a planet rising from the ashes of fallen empires, it is time for things to change. 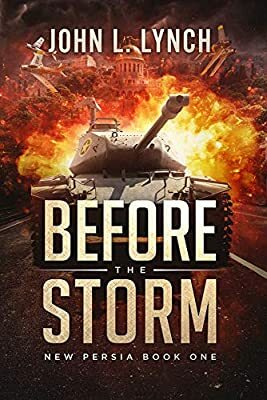 BEFORE THE STORM is the first book in the New Persia series of military science fiction novels. John Lynch is a second-generation Peruvian immigrant who misspent his youth by reading too much. He foolishly joined the military and even more foolishly went to college. He has been a sailor, soldier, sandwich maker, GM receiver, dishwasher, library assistant, pizza dough stretcher, delivery driver, mail carrier, cable salesman, graduate student, submarine tour guide and novelist.